The eLogger V4 supports up to two Hall Effects or Brushless RPM sensors! FEATURES: Measures RPM via pulses from one or two wires leading from the electronic speed control to the motor. 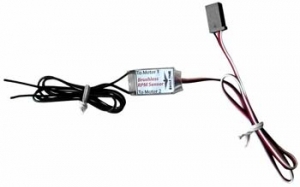 Works with all known brushless motors only-will not work with brushed motors! Use optical sensor for bushed motors.